Looking for a different way to make your evening snacks? Or you need something special to serve for iftar meal? Then prepare this egg kebab for a delectable iftar snack recipe and to enjoy your evening tea. For all those eggetarians, this is a great treat. Do try this for your iftar party and am sure the whole family will enjoy having them. This egg snack is very easy to make and is very simple too. Sometimes the simplest snacks recipes are the best and this egg snack is one among the same. Kebabs or kabob is a dish which is roasted or grilled on the skewer or as it is which can be a piece of meat or fish or veggies. Like chicken kebab, mutton kebab, fish kebab there are lots of varieties in kebab recipes. Depending on the taste and texture we can make kebab in different ways. Recently i have shared a chicken kebab recipe video - Chicken sheesh kebab recipe. So lets move on to the recipe. Here am sharing a very popular egg recipe or egg snack. 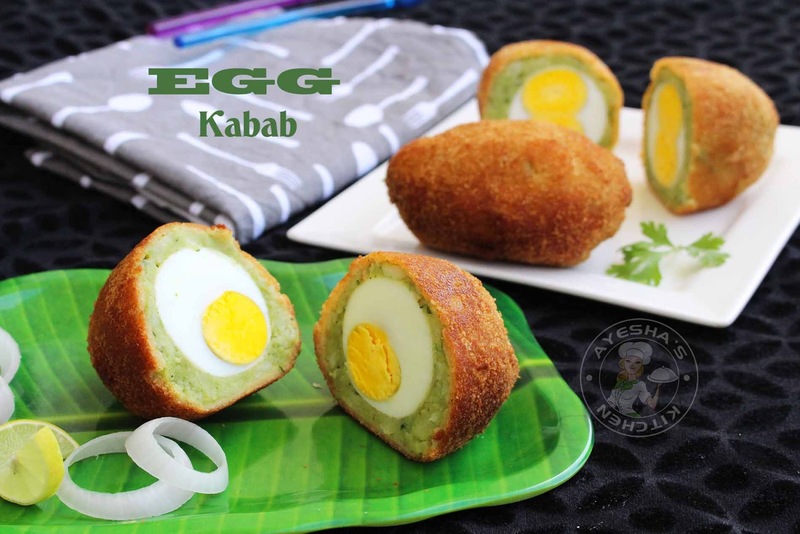 Egg kebab can be prepared in many ways. 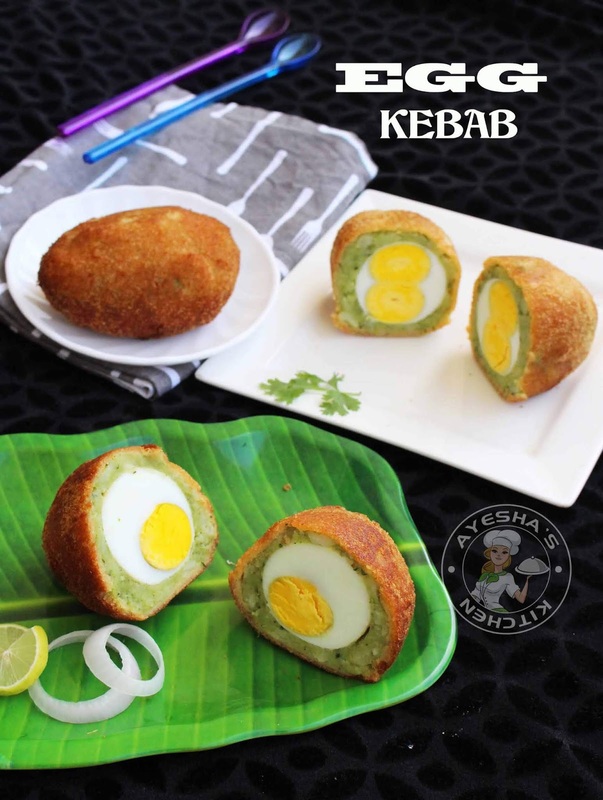 But this egg kebab recipe is a great visual treat for an iftar party. Moreover, this snack recipe is very popular among Malabar recipes or Malabar snacks. And is popularly known as Thenga muri (Where thenga means coconut and muri means a piece). So thenga muri literally mean a coconut piece. This is because this egg kebab looks like a piece of coconut and hence it is named so. Nowadays, snacks are the main attraction of any iftar parties in Malabar and this Malabar snack (Thalassery thenga muri) is very popular among them. Here the hard-boiled eggs are fully wrapped in a spicy potato mixture, dipped in egg mixture and then rolled in bread crumbs, finally, it is deep fried to perfection. 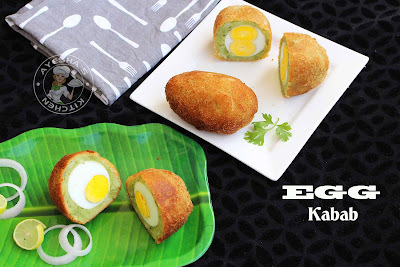 Yeah, am sure this is a great egg snack recipe for making your get together parties or evening parties more delectable. Please watch the below video showing how to make egg kebab. Please watch and subscribe my channel too for more videos. First, prepare the green masala. For that, grind together chopped coriander leaves, green chilies, garlic and ginger without adding water. Grind well. Now heat a pan with 2 tbsp of oil. Saute this ground coriander paste until the raw smell disappears. Saute over a medium-low flame. When done, add the mashed potato and mix well until well combined. When done, set aside in a bowl. (you can also add minced chicken to this potato masala for making this snack more yummier). Now in another bowl combine egg with cornflour water (mix together 1 tsp of cornflour with 2 tbsp of water). Mix well and set aside. So let's prepare the egg kebab. Take each hard-boiled eggs and roll it in cornflour well. Set aside. Now grease your palm and roll out a medium sized ball from the prepared potato mixture. Flatten it your palms and place an egg (rolled in cornflour) inside and cover with the potato masala. Shape it well within your palm. Repeat the same with the remaining eggs. Now take each prepared kebabs and dip in egg mixture. Roll in bread crumbs and again dip in egg mixture. Finally roll in breadcrumbs again. Heat oil in a wok for deep frying. Slide each ball in the medium hot oil (oil must be medium hot) and fry until browned. Serve warm. Please watch the video of the making of Thalassery Thenga muri here.